Just as excitement over the Oculus Rift is buzzing right before E3, it looks like the HTC Vive headsets are being shipped out to developers right now. However Steam notes that only "major movie studios, triple A developers, to small indie teams working on their first title" will get the Vive while shipping will continue throughout the year to more devs. In addition to the head mounted display, the fortunate few will receive two Lighthouse base stations, two wireless Steam VR controllers, various cables and of course, instructions to get started. This is fantastic news because it means we'll start to hear about more VR content and hopefully see a decent array of games when the headset actually comes out. Official pricing has yet to be announced though it should fall into the same category as the Rift's $400-$600 (about £254/AU$498 to £381/AU$747) range. 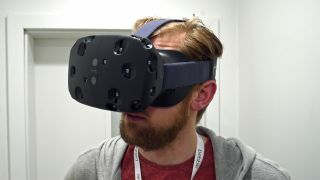 The Vive will also launch later this year, and pending any delays, should make it a difficult decision between the Rift and Project Morpheus which are purportedly slated to release in early 2016.